“Gone With the Wind,” “Mr. Smith Goes to Washington,” “Stagecoach” and “Ninotchka” all premiered that year. 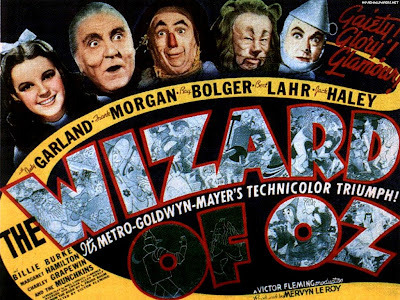 It was also the year when Dorothy and Toto departed sepia-toned Kansas for the Techicolored Land of Oz in her quest for the Emerald City. In 1939 the City of Portland was filming as well. Two years earlier, Portland’s Traffic Engineering Bureau was established under the Commissioner of Public Works. As population and vehicle ownership increased, the streets of Portland were becoming more dangerous to drivers, bicyclists and pedestrians. The Bureau was established to control all matters pertaining to the design and placement of traffic signs, signals and other traffic control devices. In the fifteen years since 1925, more than 900 persons have died as the result of traffic accidents in Portland. 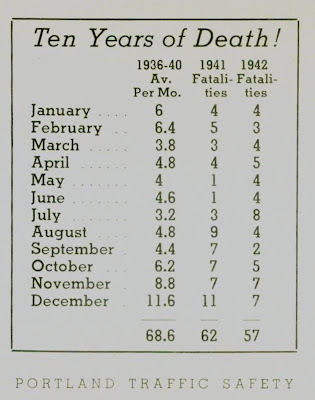 The city experienced one traffic death every five and one-half days in the 1930’s. -Portland Traffic Safety Commission August 1940. In addition to the Bureau, the Portland Traffic Safety Commission was established to educate the public on traffic issues. Drawing from traffic engineering, law enforcement, commercial, education, legislative and community sectors, the Traffic Safety Commission published a bi-monthly newsletter promoting safety for all modes of transportation in Portland. -Portland Traffic Safety December 1940. 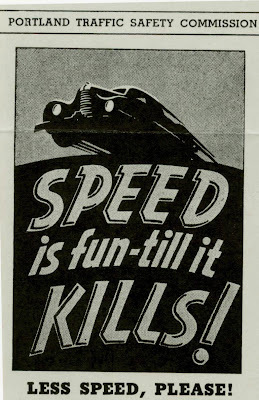 - Portland Traffic Safety September-October 1941. 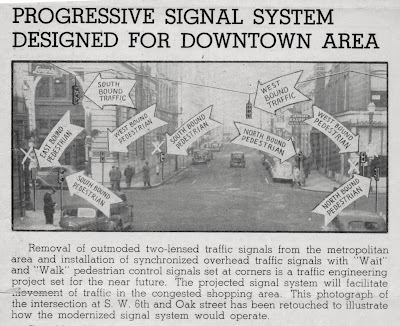 An area of primary concern for both the Portland Traffic Engineering Bureau and the Portland Traffic Safety Commission was the adoption of traffic signals to bring order to the city’s chaotic streets. In 1939 the Traffic Engineering Bureau made a film which combined new and older footage shot at Portland intersections to document the progress made in traffic control. The first segment features the intersection of Washington and 6th. It dates from Christmas 1936. There does seem to be some form of traffic control in place, however imperfect. The VC streetcar stands for the Vancouver Line, the original light rail connection over the Interstate Bridge. The small WH (Willamette Heights) streetcar is a World War I era Birney “Safety” design that featured a single operator. Note the automobile that uses the streetcar to get through the intersection, only to be held up by a wave of pedestrians. The short view at SW 6th and Alder which follows shows bike riding to be a dicey proposition. "Things fall apart; the center can not hold; Mere anarchy is loosed upon the world"
-William Butler Yeats, in "The Second Coming". The intersection of Interstate Avenue and East Broadway in 1939. Pandemonium and entropy. It was listed in the Civic Review of Portland Oregon, 1937 as the city’s most dangerous intersection. Chaos reigned supreme as sheer force of numbers and the will to power ruled the left turn lane. The buildings on the corner still exist today across the street on Broadway from Memorial Coliseum. Note: the pedestrian transit islands, accessed by subterranean tunnels near the Broadway Bridge. Both streetcars, old and modern and trolley bus (trolley coach) transit can be seen on the Broadway, Mississippi and St John’s lines circa 1939. Near the end of the clip, the streetcar on the Broadway line loses its connection with the wire and a motorman leaves the safety of his car to reconnect. 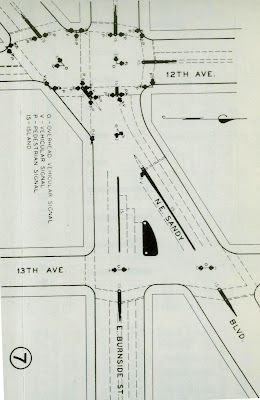 The dreaded intersection of E. Burnside, Sandy and 12th was already a formidable nemesis in 1939. Above; the Portland Traffic Commission's plan to tame it with traffic signals. The intersection of Burnside, 12th and Sandy in 1939. Six seconds pass, then without warning, The Wizard of Oz moment! 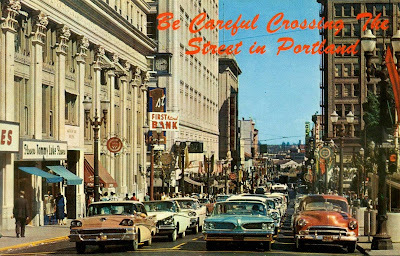 Pre-World War II Portland changes from black and white to color! Note Portland’s electric buses (trolley coaches) in both 1937 (green) and 1939 (cream and red) paint schemes. Clean, quiet and green!. SW Morrison and 18th near Civic Stadium (PGE Park). Note the green streetcar in Portland Traction’s paint scheme adopted in 1925, at the suggestion of Portland school children. Approximately one third of Portland’s streetcars were repainted from their original dark red and cream paint (also seen in this clip) before reverting to a lighter shade of red in 1939. By the time color photography was common in the later 1940s; the green streetcars had been repainted or retired. Color views are extremely rare. It is only in this film that have I seen them. 6th & Morrison, pre-bus mall era, shot from in front of the Portland Hotel and the Pioneer Courthouse. The traffic cop’s circle-spot could not have been comfortable. West Burnside and 18th in 1939, looking east towards where I-405 was not yet dug. The green bus is a gasoline powered “stinkbus” (as the diesel bus precursors were known). The next views are from 19th looking north toward Burnside. Firefighter David Campbell’s memorial park can be seen to the side. Sandy Blvd at 28th, followed by 33rd, (west then east, check out the action at the flashing yellow light) then at 24th and 20th. Some of Portland’s more thorough historians dedicated themselves to preserving the memory of the streetcar system. Departed masters such as John Labbe, Bill Hayes and David L. Stearns sought to capture the Portland’s street railway era as it vanished (there is some irony here). It was through surviving cohorts of that fraternity where I first heard of this legendary film which was reportably retrieved from a city dumpster in the late 1950s (the music is almost certainly a later addition). Eventually, through a shadowy world of relic hunters and Portland historians, I was able to obtain a VHS copy, which I converted to DVD and excerpted for this post. The Portland – Seattle Traffic Safety Challenge Cup. Portland won it in 1940 for having the fewer traffic fatalities. Does anyone know which city won for other years? Or where the cup is now?